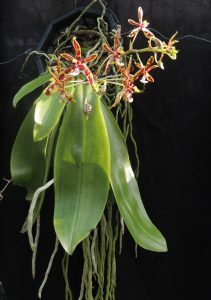 We are delighted that our favourite Phalaenopsis species is back in flower. Phalaenopsis mannii regularly flowers with us from January right through until July and despite the rigours of 2018 when it travelled to Paris in March (where it won the Best Phalalaenopsis trophy at the European Orchid Show) London in April, and to Malvern in June, it is back on schedule for another floriferous year in 2019. The photo clearly shows the natural habitat for the plant. 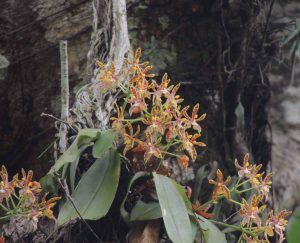 The forest is lowland seasonally dry forest and there is not sufficient rainfall or humidity for moss to grow on the branches colonised by the orchid. This plant is in the lowest branches of a large evergreen tree where light levels are quite low and it is protected from extreme desiccation in the dry season. The photograph also shows the very extensive root system this massive plant has developed over time (it must be at least twenty years old) and this will store a lot of water during dry periods as well as collecting a lot of water when it does rain. 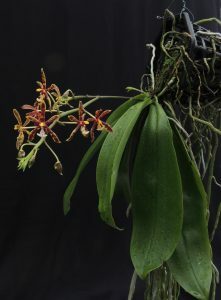 It is also noticeable that in common with most Phalaenopsis species P. mannii has a pendulous habit which will prevent water resting in new leaves and causing rots. We grow our school plant in a pendulous way by letting it lean out of its basket. It clearly loves to grow like this and is now starting to form a clump a little similar to the wonderful specimen in Assam.